You belong as a Girls on the Run coach! 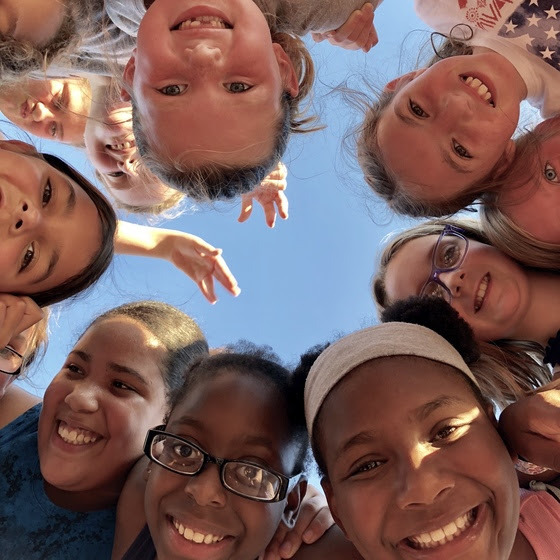 Girls in central Illinois need YOU to help them grow into the most joyful, healthy, and confident versions of themselves. As a coach, we will provide you with all the tools you need to transform the lives of girls through our powerful program. Did we mention that being a coach is not only rewarding, but incredibly fun too? We are looking for someone just like you – non-runners and runners alike! 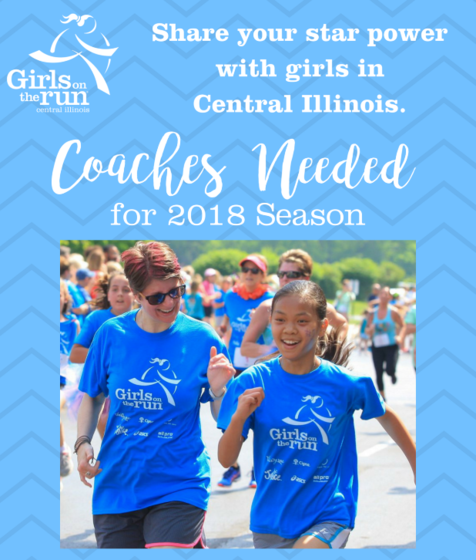 Learn more about being a Girls on the Run Coach at GOTRcentralillinois.org/coaching! Tickets now available for Light the Way event! We hope you can join us in celebrating our 15th year of empowering girls to achieve their goals and light the way to a better future. This event, formerly known as Breaking Out of the Box, is one you won’t want to miss! 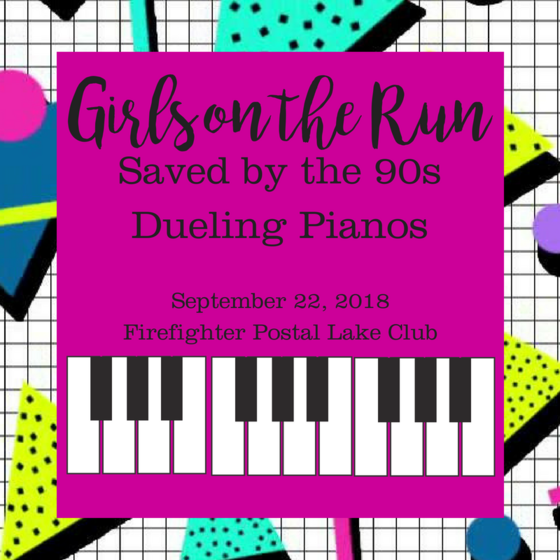 The evening will include great food by 5 Flavors, complimentary beer & wine, a silent auction, raffle, and the opportunity to connect with the Girls on the Run program and volunteers. Julie Staley will be our host. Host a Super Bowl party to remember! Enter to win this year’s raffle prize! This prize package is over $600 in value! Tickets are $20 each or three for $50. Winner will be drawn at our Light the Way event, but need NOT be present to win. Shine a light and make her future bright! Our program girls have the opportunity to cross the finish line because of you. And next Spring, we will provide half of all girls with financial assistance to participate. Those girls need your support! 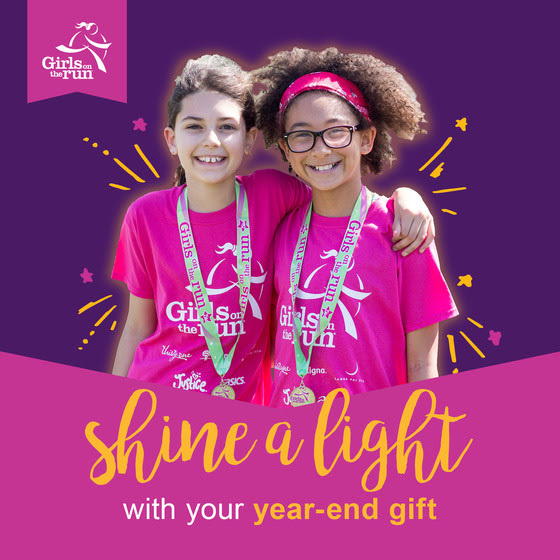 Please make a year-end gift to Girls on the Run of Central Illinois now and help more girls in our community cross the finish line, which is truly just the beginning. Help us make our 15th anniversary as remarkable as your girls by hosting a Girls on the Run team! Since 2004, our council has benefited over 9,000 girls through our life-changing program and we believe the girls at your school would truly benefit from the experience. Girls on the Run is for EVERY girl. Not only is it a fun way for girls to make new friends, build life skills, and increase their physical activity, it’s effective. We are now accepting new site applications for the Spring 2019 season and we would love to host a team at your school! For more information call 217-726-9808 or email lara@gotrcentralillinois.org. 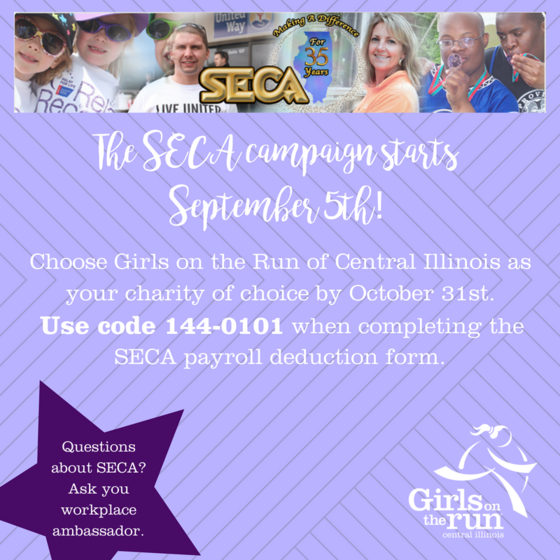 Did you know that if you are a state employee you can donate to Girls on the Run through SECA and their payroll deduction? SECA, the State and University Employees Combined Appeal, provides employees with the opportunity to contribute to a number of charities in the State of Illlinois. When SECA’s enrollment period starts on September 5th, please consider selecting GOTR of Central Illinois. SECA enrollment will be open until October 31st. If you have any questions about the SECA enrollment period, please visit the SECA website. If you are not a state or university employee, you can still donate to GOTR through United Way of Central Illinois’payroll deduction. 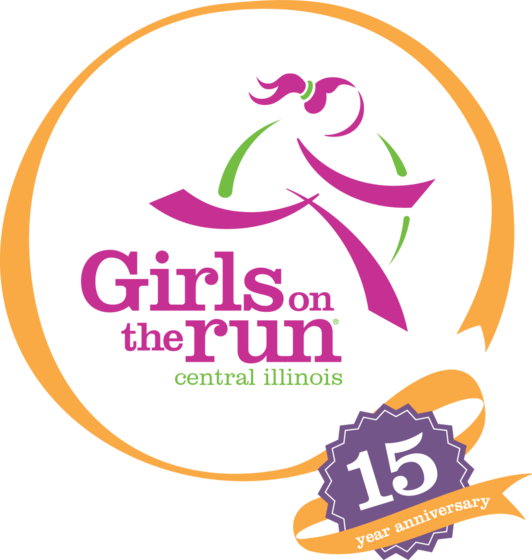 Please write Girls on the Run of Central Illinois in on their payroll deduction form. If your company does not participate in SECA or the United Way payroll deduction, you can donate directly to GOTR. With your recurring payment, you become a member of our Pacesetter Club! At Girls on the Run, we know how one program changes lives, one at a time. Whether as a program participant, family member, or coach, we have seen the positive change our program has on our community. All donations to our Power of One campaign will support scholarships for girls this fall. Without scholarship funding, girls in central Illinois will have a harder time handling life’s stressors, like bullying or managing their emotions. This is where you come in. You can give girls the opportunity to empower themselves, make new friendships, and become a happier, healthier girl through our program. “GOTR is the first program that has allowed me, as a mom, to participate directly with my daughter. GOTR presented physical, social and emotional health in a very fun way for the both of us!” – GOTR mom and coach. Help us provide scholarships to our girls this fall by donating to the Power of One campaign. New Coaching Opportunity in Lincoln! This fall we will be starting our first community site at the Lincoln Park District and we are in need of several adult coaches to help out. Click here to learn more! Interested in bringing our transformative program to your school? Learn more at www.GOTRcentralillinois.org or email lara@GOTRcentralillinois.org! Mark your calendars for our Fall 2018 program registration. Registration will open on August 15. 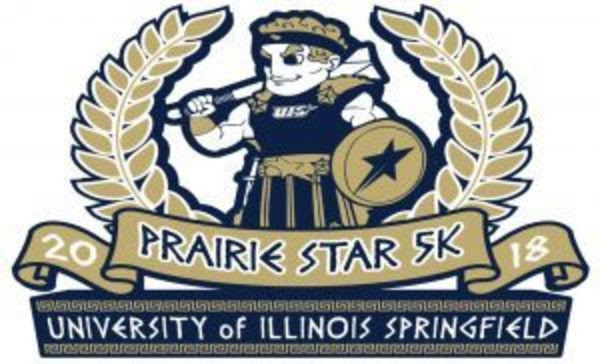 The season begins September 4 and runs through the fall 5k on November 10th.